Many people do not even know what treasures they put their feet on every day – namely, any amount of energy that hides in the ground and is easily accessible. For example, with the GeoCollect-Absorber-System, which can be installed in old and new buildings without much effort and with minimal space requirements, because it uses the heat that lies just below the earth’s surface. What is good for heating in winter can be used in the summer for almost free cooling. With the GeoCollect-Absorber-System you can get as fast, uncomplicated and cheap as much energy as you want – whether for heating or hot water – of course independent of the season and the climate. The nice side effect: Since there is no combustion and therefore no emission of pollutants, geothermal energy is one of the sources of energy whose use helps to significantly reduce the emission of greenhouse gases. At the same time, you will finally become independent of increasingly scarce raw materials such as oil and gas. And thus make a valuable contribution to protecting the environment and your household budget. We are a pan-European network of construction specialists. Work successfully since 1995 on the system of surface temperature control (EWKtec GmbH) for residential and office space. Our systems promote the feel-good climate of your rooms and your well-being. 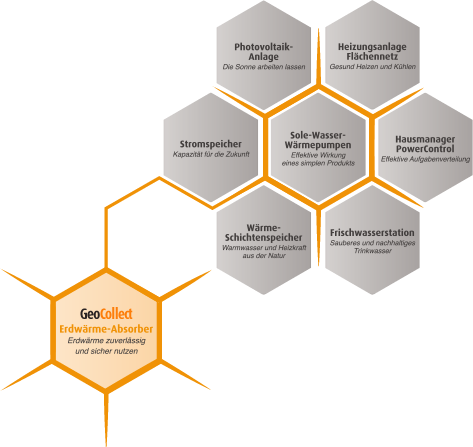 GeoCollect relies on innovative and sustainable concepts for heating and cooling rooms. We use the energy of summer in winter and the cold of winter in summer. Become a partner and benefit from sustainable energy generation.